Secret Empire: Uprising #1 Review – AiPT! If a tie-in can tell its own story that makes it worth a look, but if it can do that and matter to the bigger narrative that’s a win-win. I approached this Secret Empire tie-in skeptically, but given it’s utilizing the younger and more chipper heroes in this new Hydra world it’s hard to resist it offers possibly the most positive outlook on the event yet. 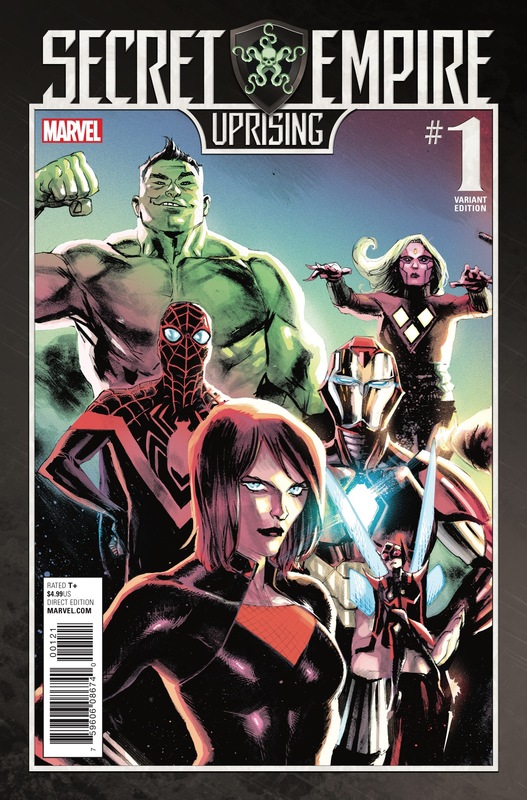 If you’re a fan of the Champions series you’ll probably need this in your life as Viv Vision, Spider-Man (the Miles persuasion), and Riri are all mainstays of this new team (among others). It also heavily involves Black Widow, who is probably Captain America’s #1 enemy at this point and most probably will play a huge role in the eventual conclusion to the Secret Empire event. Having read Secret Empire #3 I can safely say this is the most positive part to come out of the event yet. That’s very much a good thing, as it shows Derek Landy captures the voice of these characters very well. It also reminds us these heroes are young, incredibly likeable, and the brightest America has to fight Hydra. After Secret Empire #2 we learned Black Widow has allowed the characters into the “Red Room”, which is basically a term to mean spy organization. She’s training them to be spies, which is a particularly good skill given even being seen by the naked eye could mean imprisonment forever. Even when Black Widow tests their resolve–and makes them cry–the characters maintain a positive attitude that’s relatable given how harsh the world has become. How can we exist without a bit of positive energy?! The plot of this issue basically serves two purposes: Set up Black Widow’s training process and then thrust a few of the characters into an infiltration mission. This issue takes place after Secret Empire #3, though not too heavily. Basically, their mission ties into something Black Widow acquired in issue #3, but doesn’t spoil that issue much. The mission is revealed to be shockingly silly in a way–it’s choir tryouts–which should make singing competition readers excited. The innocent nature of what the team has infiltrated is quickly found to be warped and a bit evil due to some great characterization of the choirmaster. He’s goofy looking and way over the top and a super jerk. He’s the type of teacher you’d want dead on the first day of class. This allows Landy to add in a bit of humor and push the buttons of the heroes. The $4.99 price tag may make some scoff, but Landy and artist Joshua Cassara do a bang up job filling this issue with a lot of content. There’s certainly no decompression going on and by the end you’ll feel like you got your money’s worth. That’s partly due to Cassara’s solid art, with some exceptional layouts and story progression. One-half page showcases Amadeus Cho’s singing skills–and the arrogance that comes with it–and in another, the very honest portrayal of the heroes hanging, and then witnessing a compatriot storm off crying in solid fashion. The choirmaster is perfectly drawn complete with a thing and obnoxious mustache. He’s got a spindly body type that’s at once creepy and irritating. Great work. Probably more of a criticism of the entire event than just this book, but I’m growing tired of how dark they’re making everything. There’s a dark tone to this book that is certainly attempting to portray the events as depressing, but it doesn’t necessarily jive well with how positive and fun these characters are. They certainly aren’t happy to any extreme, but they’re still likable, which is saying something when you consider the main series is depressing on all fronts. Give us a brighter, fun looking book already! Having not read Champions I was a tad lost as far as who The Freelancers were or why they matter. They don’t get a lot of page time and are set up more as an old enemy with little character work. There’s a nice moment of them getting a shred of heroism in there, but the history was lost on me. This is an excellent tie-in because it does a great job establishing the characters and punching up the issue with a lot of story. If you’re going to buy one tie-in to the Secret Empire event this might just be it. Offering a slice of positivity in a dark story, Secret Empire: Uprising will give you hope! A fun and exciting tie-in that shows what it's like to become a spy. More or less. Why must every Secret Empire book be cast in so much shadow!